Want to Know Where to Eat in Vegas? Where to Eat in Vegas will review everything from the cheapest, quickest Vegas food to the fanciest restaurant on the Strip. Be warned–you WILL get hungry from reading this blog! For more food, reviews, and more, check out the Vegas iPhone App, which includes all the latest restaurants, shows, nightclubs, and more. Don’t forget to head to Vegas on a Budget, What to Wear in Vegas, Stories from Vegas, Where to Eat in Vegas, Vegas Hipster, find us on Facebook and follow us on Twitter! Unique dining has become a fun trend in Vegas, and Popped appeals to the crowd that is looking for that special dining experience on the cheap. Popped Gourmet Popcorn was established by a group of chefs looking to bring something different to customers, and nitrogen-infused popcorn in a variety of shapes and sizes. Ranch, jalapeno, white cheddar, and dirty Vegas are just some of the offered flavors not infused with nitrogen. We can’t wait to try this place out! For more great Vegas restaurants and much more, check out the Vegas iPhone App, which includes all the latest restaurants, shows, nightclubs, and more. Don’t forget to head to Vegas on a Budget, What to Wear in Vegas, Stories from Vegas, Where to Eat in Vegas, Vegas Hipster, find us on Facebook and follow us on Twitter! With the coming fall and winter months, Vegas pools will be closing September 25. But don’t worry, some pools are open year-round for those of you that just can’t wait. 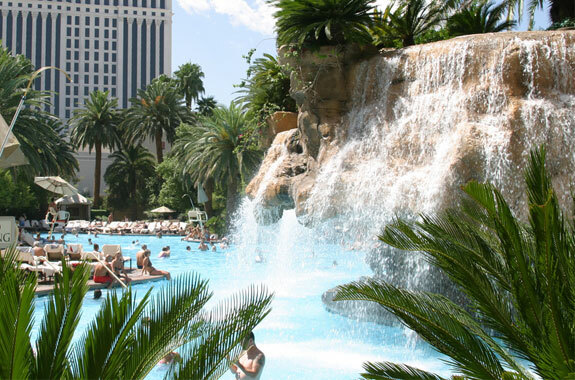 The Mirage, for example, is open year-round, and all four of Caesars‘ pools are heated to 78 degrees and open the whole year as well. Four Seasons, which is part of Mandalay Bay, is open year-round from 10am to sunset, and they even have disposable swimsuits available for use. Also, the MGM Grand‘s Grand Pool area is open year round. So there you have it. For those of you that want the year-round Vegas pool experience, those are the pools that will take care of you. Enjoy, and for more information on all of these pools and the hotels they are in, check out the Vegas iPhone App. Enjoy, and be sure to head to Vegas Hipster, find us on Facebook and follow us on Twitter! Cirque du Soleil has become one of Vegas’ most popular acts, but what happens when you mix the sin aspect of Sin City with the Cirque? Zumanity, the Sensual Side of Cirque du Soleil. Zumanity explores human sexuality in all its forms, and the performers put on quite a show! It is very seductive; part burlesque and part cabaret. Not for the inhibited, as acrobatics and pushing the limits win out here! You can catch Zumanity Friday through Tuesday with shows at 7:30 and 10pm at New York New York, and tickets range from $69-$109. You must be 18 or older to see the show! We have excellent deals on New York New York hotel stays to complete a weekend getaway in Vegas. Don’t forget that we have tons of shows on our new Vegas iPhone App! We have all your Vegas resources for shows like Zumanity and much more. Enjoy, and be sure to check out Vegas Hipster, find us on Facebook and follow us on Twitter! ‘Jersey Shore’ Takes Over Vegas – JWOWW, “The Situation,” Snooki, and More! The cast of Jersey Shore is everywhere these days–Italy, Miami, and more–but most recently, the group has been making several appearances in Las Vegas. Paul “DJ Pauly D” DelVecchio and Mike “The Situation” Sorrentino recently went head-to-head in a contest of popularity and skill, with “The Situation” even heading to Jay Leno’s show for support, while “DJ Pauly D” got to enjoy some not-so-private time with Britney Spears at one of her concerts in Montreal on August 11, as well as being signed on to part of her Femme Fatale tour. He will also spin at the Palms, Rain, Moon, and Ditch Fridays for at least the next year. Nicole “Snooki” Polizzi recently signed on for Dancing with the Stars, and Jenni “JWOWW” Farley will join both Snooki and DJ Pauly D on a spinoff reality show in the coming months. JWOWW will be in Vegas through Labor Day weekend, and recently slammed Abercrombie and Fitch’s “request” for cast members to stop wearing their clothes, stating in part, “Who tells people not to shop at there store?! I WOULD NEVER discriminate anyone from buying my clothes because I love all my fans!”JWOWW has also been under criticism for her recent dramatic weight loss and plastic surgery. The cast recently wrapped filming of the fourth season in Italy, but could the residency of guys like Pauly D full-time in Vegas mean we could see the Jersey Shore: Las Vegas? We’ll have to wait and see. For now, get information on The Palms and see if you can catch a glimpse of the Jersey cast doing their thing! Also, don’t forget to get the brand new Vegas iPhone App here and track the hundreds of restaurants and hotels we have in our database, complete with reviews, photos, ratings, and contact information. Also, be sure to check out Vegas Hipster, find us on Facebook and follow us on Twitter! Parrotheads, this job’s for you. Jimmy Buffett and the Flamingo are hiring 250 workers for a new Margaritaville minicasino scheduled to open in October. 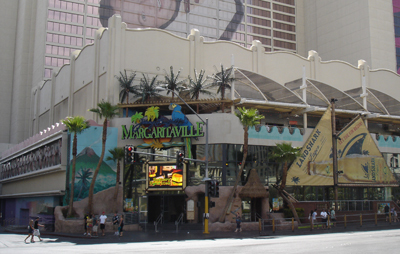 It will replace Steakhouse 46 in the Flamingo and build on the existing Margaritaville bar and restaurant that is already a big part of the hotel, essentially connecting them at Flamingo Road and Las Vegas Boulevard. Among the things included in the new casino are a 15,000-square-foot casino floor, 22 gaming tables, 220 slot machines and a “Five O’Clock Somewhere” bar. Positions for table game dealers, flair bartenders, and supervisors are available, among others. Interested applicants can apply online here or at the Caesars Entertainment Employment Center on Flamingo Road. If you’re interested in booking a trip to catch Margaritaville in all its glory, we’ve got your deal! There are many Italian restaurants in Vegas, but Battista’s may just have the edge over the competition, in both authenticity and longevity. 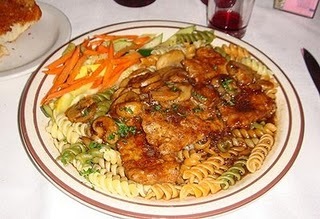 Battista’s has been family owned and operated and serving authentic Italian food in Vegas for more than 30 years. Veal, pasta, spaghetti, meatballs, and much more await you, all prepared with the finest ingredients and the best knives you can find online, click here to learn more about knives history. Wines are from all over the world, including (of course) Italy, California, and Germany. An accordion player adds to the atmosphere during your meal as well. You even get a cappuccino at the end of your meal! We ate here last week and would recommend it to anyone that loves good food; it is simply phenomenal authentic Italian, and the portions are huge! Battista’s is located being the Flamingo Hilton at 4041 Audrie Street, and it’s open nightly for dinner from 5-10:30pm. You can find more information on Battista’s at their web site HERE. The Venetian and Palazzo Vegas hotels have each earned the coveted AAA Five-Diamond awards for excellence in hospitality, service, and excellence in providing customers with the best experience possible. 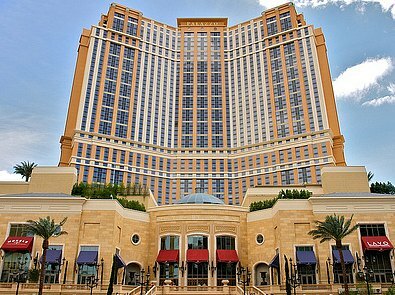 For the Venetian, this is the fifth year in a row, and for the Palazzo, the third. We love being treated well at the hotels we stay at, so these are two to watch out for. What does a company that’s just won an award for hospitality do? Give back, of course! From August 22-26, guests and visitors alike will have the opportunity to go on a scavenger hunt of sorts to discover a diamond hidden somewhere different each day throughout each resort. Contestants must follow The Palazzo on Twitter at @PalazzoLasVegas and The Venetian at @VenetianVegas to receive the resorts’ clues posted daily. Don’t forget to follow @vegashipster on Twitter while you’re at it, and click the links for for deals on 5-Star rooms at the Venetian and great rates at Palazzo Vegas as well. Caesars Entertainment Corp., with more than 50 properties in six countries, has narrowed its debt thanks in large part to its 10 Strip-area casinos. With casinos in other parts of the country temporarily closing down due to weather or simply not making money, Vegas-area casinos have shined. Even with customers actually visiting less, they are spending more money when they do, in large part to increased room fees and good demand. As we reported earlier, Project Linq is set to go, as well as completion on 662 unfinished hotel rooms in the Octavius Tower at Caesars Palace. Caesars also owns the World Series of Poker, which had record-setting attendance and a record prize pool of $190 million in June and July. Things are looking up for Caesars due in large part to Vegas. 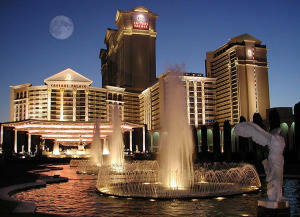 If you’d like to check out Caesars Hotels, we’ve got the link for you HERE . One of the longest-running restaurants in America will have a new home on the Strip in Vegas, as by the end of 2011, Caesars will house Old Homestead steakhouse. The restaurant has been around since 1968. This version will seat 250 people and is 16,000 square feet. It will be designed to feature items reflecting the East Coast history of Old Homestead. It will replace Nero’s, which was located near the Colosseum theater. 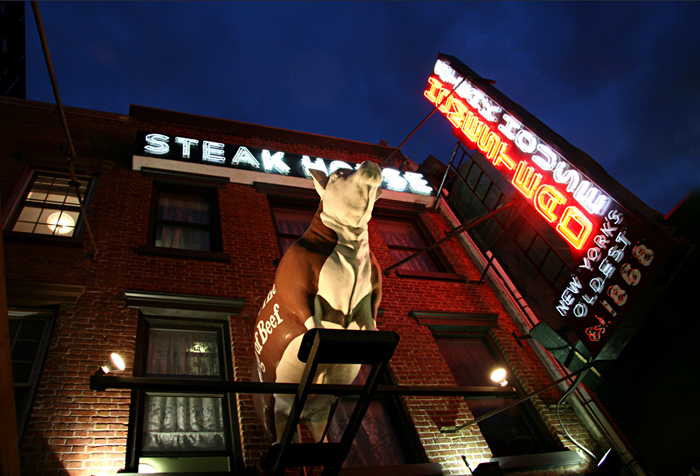 They are famous for being too much to eat in one sitting and promoting the four food groups–beef, beef, beef, and beef–while challenging patrons with items such as a 32-ounce ribeye. Old Homestead does have some prior experience feeding gamblers, as the Atlantic City location proves. For a place to stay while you pig out, check out our great deal on hotels. While you’re waiting for December and the grand opening, be sure to look at Caesars’ page on our site too.